(CHARLOTTE, NC) - Advancing their focus towards providing industry leading solutions, the Charlotte Knights are proud to announce that TicketReturn will continue to serve as the exclusive provider of all ticketing solutions and services. TicketReturn's Box Office, Online and Mobile ticketing technologies will enhance the Knights Ticket Operations that support Minor League Baseball's attendance leader. 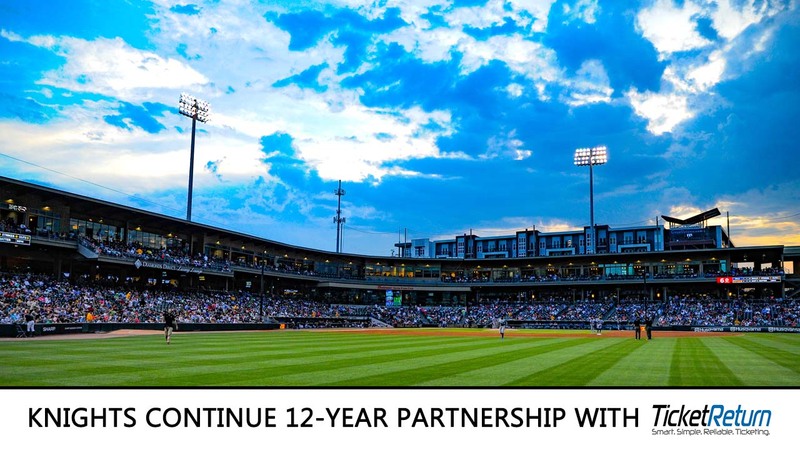 "We are excited to renew our long-standing partnership with TicketReturn," stated Charlotte Knights Chief Operating Officer Dan Rajkowski. "They continue to develop industry-leading features and functionality that allow us to provide a user-friendly ticketing experience for the hundreds of thousands of fans that we welcome each season to BB&T Ballpark." TicketReturn is the leading provider of ticketing solutions for MiLB, as well as serving minor league hockey, soccer, basketball, and lacrosse teams throughout North America. This partnership furthers TicketReturn's continual focus towards development that now reaches more than 250 client venues and delivers over 38 million tickets annually. They pride themselves on offering an easy-to-use platform, while providing the best customer service in the ticketing industry. "The Charlotte Knights have proven that they can deliver league leading attendance year in and year out," stated TicketReturn Vice President of Sales and Marketing Christie Hussey. "TicketReturn is happy to collaborate with the Knights to deliver technology that accommodates their substantial demand and fuels continued attendance and revenue growth for the future." The 2019 Charlotte Knights home opener at BB&T Ballpark in Uptown Charlotte is on tap for Thursday, April 4 at 7:04 p.m. against the Durham Bulls, the team's sixth season in Uptown Charlotte. Season memberships for 2019 are on sale now and can be purchased by calling 704-274-8282. Single game tickets will be available at a later date via TicketReturn.com, with details to be announced on CharlotteKnights.com in February.